Most new dads think they cannot bond with their baby as well as the mother does. Fathers may feel tensed about getting connected with the baby. 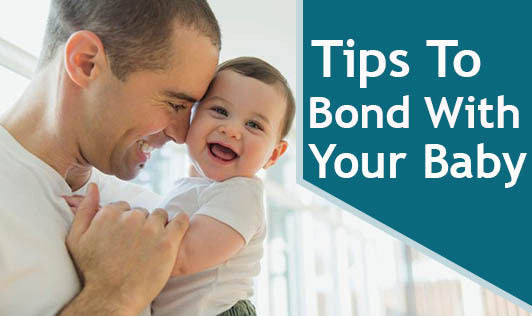 Here are a few tips to help new dads connect with their babies as comfortably as the mothers do! 1. Cradle the baby: This is the first step to create a strong bond between the baby and you. 2. Make eye to eye contact: The baby has a tendency to stare at human faces, and it has been proven that the attraction is not the face but the eyes! This is a very effective communication for the babies. 3. Sing for the baby: Babies have a very natural attraction towards music. Try singing for the baby while holding her/him in your arms and swinging them to sleep. The babies will feel soothed. 4. Talk to the baby: Look at the baby and talk to her/him. They get attracted by facial expressions you give and the sounds made while talking. 5. Change the diapers: This may seem to be a less appealing way of bonding with your baby, but it is in fact a very effective way of bonding. While changing the diaper, keep interacting with the baby which will help you to improve attachment with your baby. 6. Help in bottle feeding: Once the baby is weaned off breast milk, the father can take up the task of bottle feeding some times. This gives you another opportunity to make eye contact and create a protective feeling in the baby. 7. Take photos: Taking pictures while you are playing with your baby will fetch you a lot of opportunities to make the baby interact with you. And the photos will capture all those lovely moments that are worth cherishing. 8. Be patient: Be calm and patient while trying to bond with your baby, as it might take a little longer than you had expected. 9. Remember the child in you: While you interact with your baby, try to bring out the child in you. This will help to bridge the gap between the two generations. 10. Enjoy fatherhood: Many new dads will feel confused and not so confident about what should their role as a father be. But do not get tensed, it's a blessing; it's a joy that you are experiencing. Enjoy every moment of it!